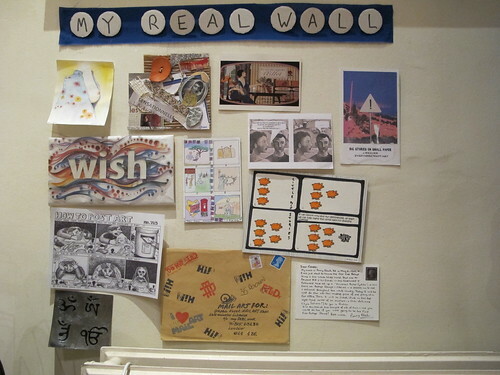 my REAL wall presents – The first ever joint mailart talk by Andy and Elena at Pimlico library! 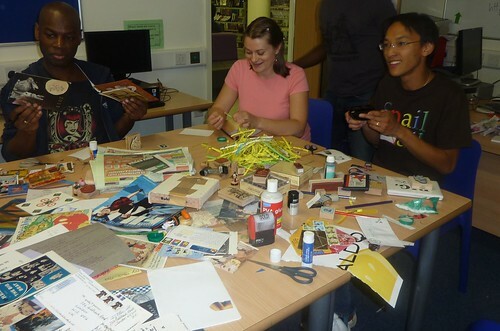 On 27th April 2011, Andy and Elena gave their first ever public mailart lecture at Pimlico library together. 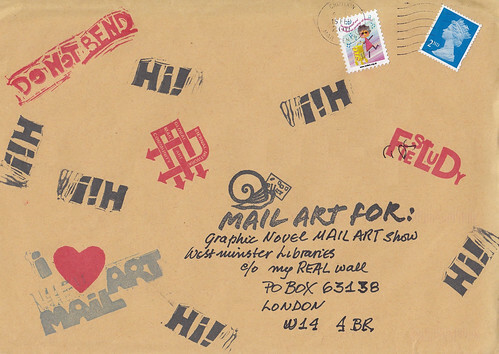 As part of the graphic novels season, we put together the Little Big Stories show, and the librarians thought it would be a good idea to include a talk about mailart in the season as it is a relatively unknown artform. We agreed to run the talk together and the library bought the stamps and postcards for the participants. By the end of the session, everyone had made at least one piece and put a stamp on it to post. I’ve since heard that some of the pieces have been received. If there’s anything more satisfying than making a piece of mailart, I think it’s watching those first pieces of mailart go out from people who have just discovered the medium. It’s just great! 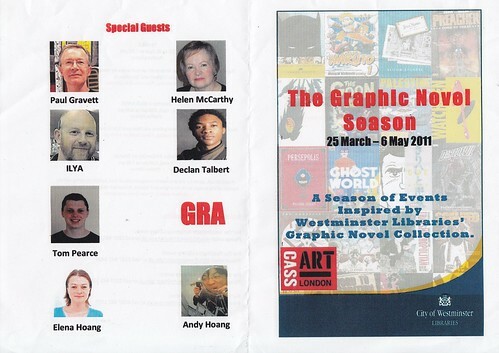 The Graphic novels season was a huge success for Pimlico and I want to take a moment to say thanks to them for putting on such a great programme of events and for including us in there (I would never have ever thought i’d have my name on the programme with Helen McCarthy and Paul Gravett! Wow! fanboy geekness heaven!). 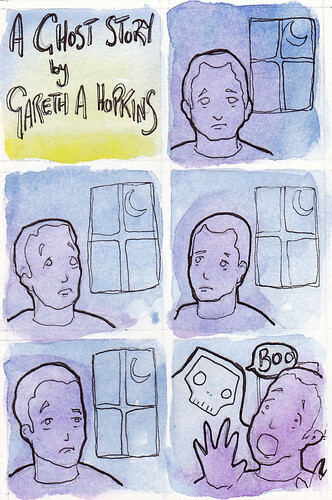 You can read a writeup of the night on their blog. It has been excellent and I can’t wait to get involved again next year! 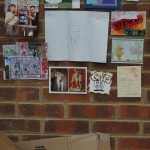 Regular readers of this blog will be aware that this year has seen my REAL wall getting involved in a number of mailart shows in London. 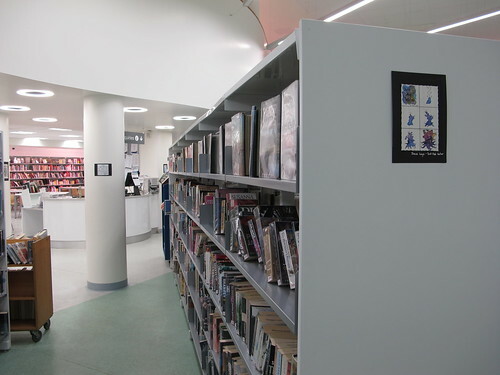 In February, I put out a call for a mailart call for my local library, called Little Big Stories, where we asked for postcard sized graphic novels in the post to display in Pimlico library. 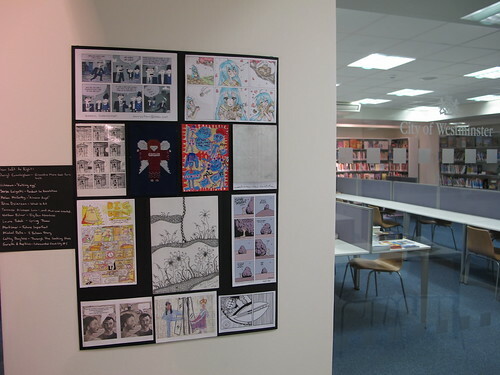 The idea was to collect in a few stories on the walls to get people interested in the graphic storytelling medium and to draw attention to Westminster library’s awesome stock of graphics. 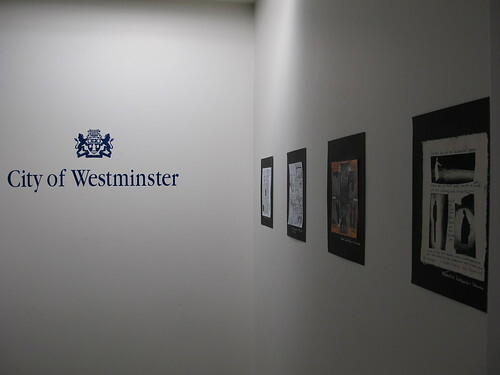 I worked with one of the librarians from the comics buying team on the show from start to finish, and the show came together through the Westminster libraries blog and here on my REAL wall. 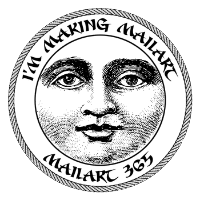 Being the first major public mailart call I’ve run, I must confess I didn’t know what to expect. Initially we set our target at 30 pieces, and after a couple of weeks, we thought we’d be lucky to even get to this. 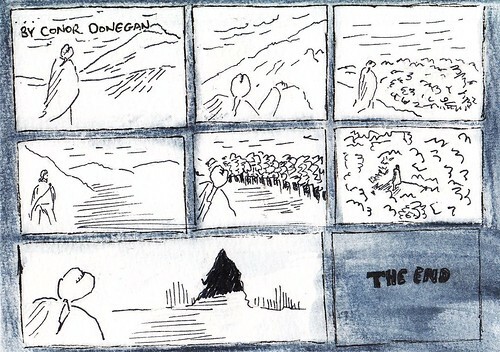 This is the very first story that came in from Conor Donegan in the USA. About 2 weeks in, something happened. Suddenly the blog started to fill up with comments from people saying that they’d be sending in stories! Me and Francis couldn’t believe it! Within a week we had shot over 30 and set our sites at 50 pieces. That target proved far short of our final number too. By the time the deadline of March 12th arrived, we had collected in 150 Little Big Stories, with 20 arriving after the deadline, which went in anyway. Another 3 arrived after me and Elena had left for our honeymoon. Sadly, me and Elena were not there to help them put the stories up, but Francis and Nisha done an excellent job of mounting the works and putting them on the walls and the exhibition has been really well received by visitors, with some even asking at the desk for the artists details and if they had books out on the shelves! The show ran from 4th April to 4th May 2011 and has only just come down, but it’s been a huge success. I’d like to say thanks to everyone who took part who made this happen and thanks to everyone for your comments and feedback too. The library were really surprised to find that their blog had so many hits during the time of the call – they’d never had that many comments or Retweets from a blog post before, so congratulations to us on that too! There’s not enough room here for all the photos, but you can check out some more on my flickr site, and below are all the received pieces. But just because the show is over at Pimlico, don’t think this is the end for Little Big Stories just yet. Me and Elena are looking to make a book to put on the shelves containing all the pieces received and more! The idea is to sell copies of it to raise some extra money for the library in these lean financial times so that they can buy even more great graphic novels for their shelves. I’ll keep you all posted about that, just watch this space. 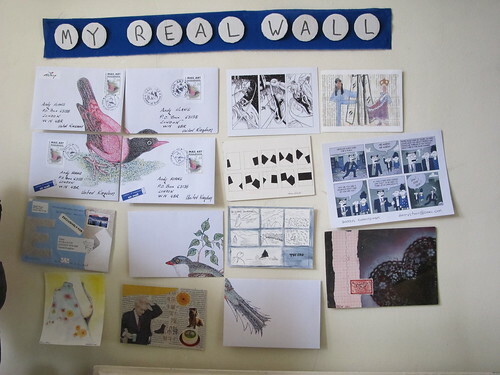 my REAL wall – More Little Big Stories, originally uploaded by andytgeezer. 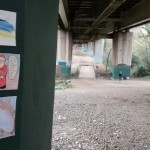 Check out the latest Little Big Stories from TicTac, Rebecca Guyver, A1 Mailart archive and others! The first of the Little Big Stories lands on my REAL wall, originally uploaded by andytgeezer. 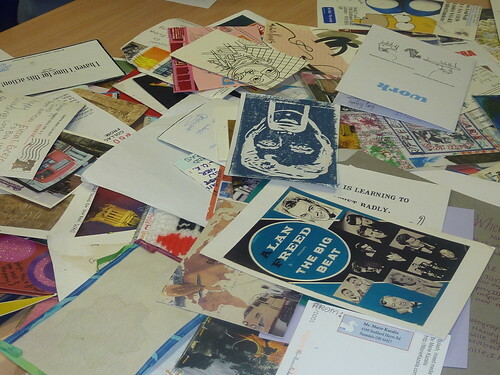 As well as the awesome Puzzleposta from Ahmet Demir, the regular mailart is joined by the first of the Little Big Story submissions for the Pimlico mailart show. No point keeping them in a box until the End of March is there! Can you tell a story in words and pictures and fit it on a postcard? If so we want to see your stories! 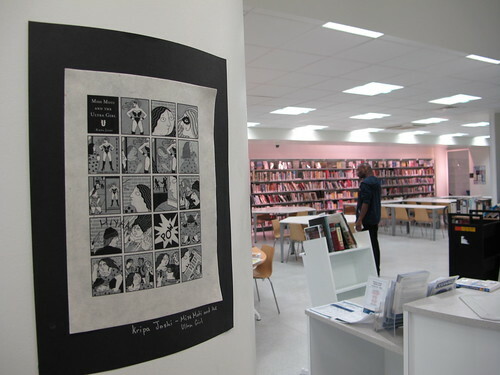 As part of the graphic novel season at Westminster libraries, we are holding a mailart show at Pimlico library, where we want to display postcard sized stories from YOU! 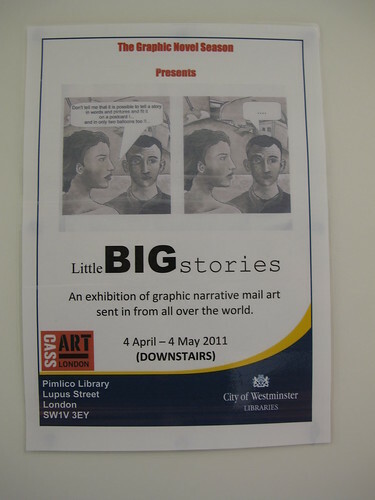 All of your “Little Big Stories” will go on display in Pimlico library in London for 2 weeks. Why not drop a comment below, or at the original post if you intend to send a piece! If I’ve received your piece for Little Big Stories, I’ll put it up on my flickr site then post it up here! Please leave a comment if you see yours, and when you send leave us a comment below with a URL so I can link you up! Deadline is March 11, 2011, so do hurry and get your pieces in!